Access to quality services and community infrastructure are vital parts of supporting sustainable and resilient rural and small town places. Renewing outdated infrastructure and supporting the delivery of services in rural communities present significant challenges from the constrained fiscal and policy realities of the 21st century. Drawing upon contributors from five Organization for Economic Co-operation and Development (OECD) countries, this book describes innovative service delivery and community infrastructure models that are appropriate to the contemporary rural and resource-dependent regions of developed economies. The examples show that an entrepreneurial approach to service delivery and infrastructure provision by local organizations and governments is needed. Critical economic and community development supports are crucial to assist creative and innovative sets of solutions that work for small communities. 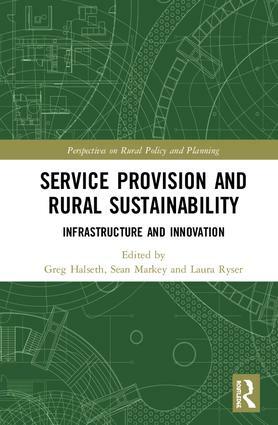 Chapters in this book argue that community development foundations for resilient rural and small town communities and regions must be co-constructed and co-delivered in partnership by both local and senior government actors, in terms of both policy and committed resources. This volume will be extremely valuable for students, scholars, and community development practitioners exploring policy-making, government initiatives, and community service provision in rural and small town places. 2. The Needy Rural – Does Living in a Rural Area Mean that You Are in Need?